After completing his national service Dennis was spotted by then Alloa Athletic manager Jerry Kerr whilst playing for Clydebank Juveniles, but spent a year with Duntocher Hibs before joining the Recreation Park club. 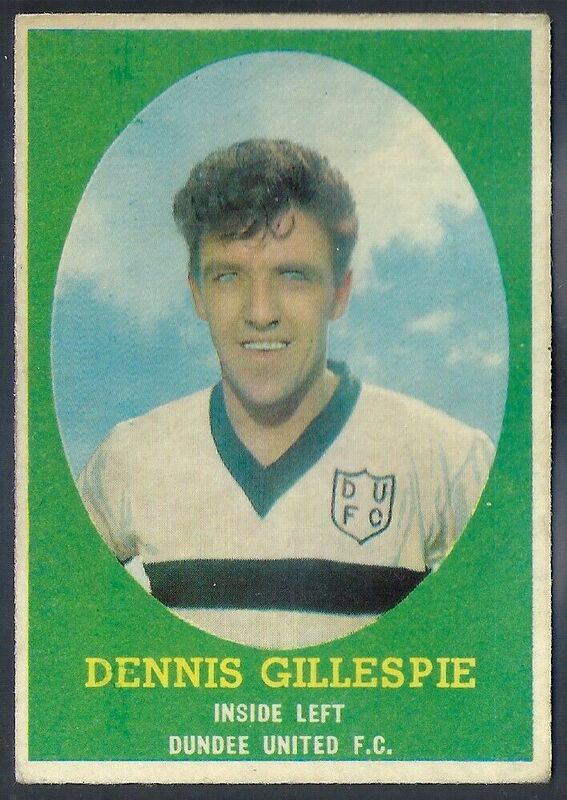 A regular in his two seasons at Alloa, Dennis was already known to the Tannadice faithful, after he had terrorised United in a humiliating 7-1 home defeat to the Wasps in April 1958, scoring twice that day. He had also scored a brace for Alloa in a 3-1 loss for United at Recreation Park the following season. When Kerr left Alloa to become United manager in June 1959, he quickly returned to his old club to secure the services of the inside-forward, who signed for United prior to the second league game of the 1959-60 season for £3,000. Making his debut the following week against St Johnstone, he turned out to be one of Jerry Kerr's most inspired acquisitions. A forceful attacking player, Dennis was a vital part of the side that won promotion to Division One that season, finishing as second top scorer, including a hat-trick against Queens Park. He was a regular in the side for the next four seasons and kept up his scoring rate, finishing as the club's top scorer in their first year back in the top flight, and notched further hat-tricks against Dunfermline Athletic and Raith Rovers. A big favourite with the fans, Dennis was the first United player to turn out at senior international level for Scotland when he played for the Scottish League against the League of Ireland at Dalymont Park in Dublin in 1961. 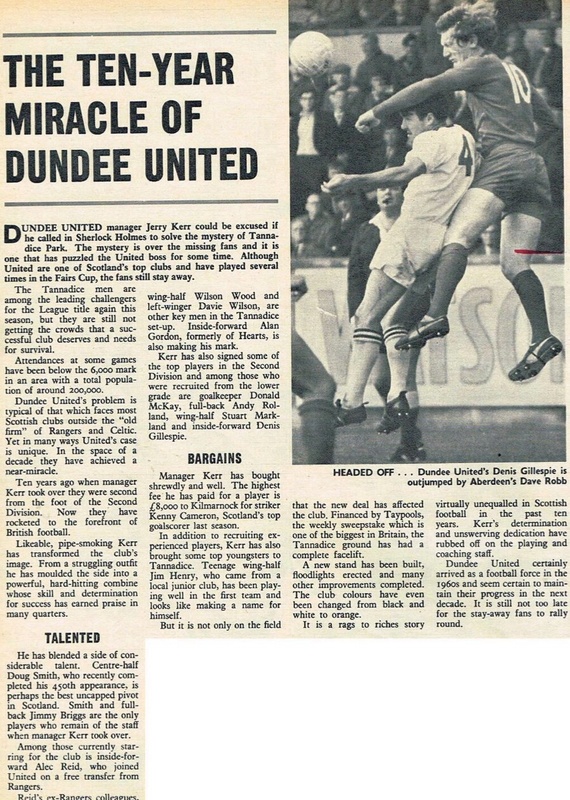 During this time, Dennis was a crucial part of the United side that reached the semi-finals of the Scottish Cup for the first time in 1963, their first League Cup semi-final in 1964, and he collected a runners-up medal after reaching the final of the short-lived Summer Cup competition in 1965. They gained the club's highest ever league position at the time when they finished in 5th place in Division One at the end of the 1965/66 season, a position that meant that the club qualified for European football for the first time. After turning 30 in 1966, he took more of a supporting role, playing in a deeper wing-half position but was still a regular in the side. He was in the line-up as United faced and defeated Barcelona in the Club's first venture into European football, as well as both legs against Juventus in the next round. In the summer of 1967, Dennis was part of a sixteen man squad that travelled to the United States to represent Dallas Tornado in the United Soccer Association competition. By season 1968-69 Dennis was the regular right half and he revelled in his new role for two seasons, playing in more Fairs Cup ties against Newcastle United, Grasshoppers of Zurich and Sparta Prague, and returned with the team to the USA for another close season tour in the summer of 1969. He spent his last two years at the Club playing mainly in the reserves, passing on the benefit of his experience to the younger players. Offered a coaching role in April 1972, he elected not to accept as he wanted to continue playing and he went to Brechin City. 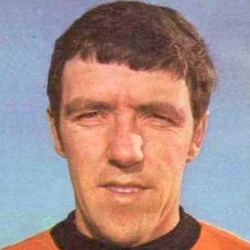 Having only been booked once during his career at Tannadice, Dennis, now playing as a sweeper, was booked three times in his first season at Glebe Park. He remained there for four years before retiring in 1976. 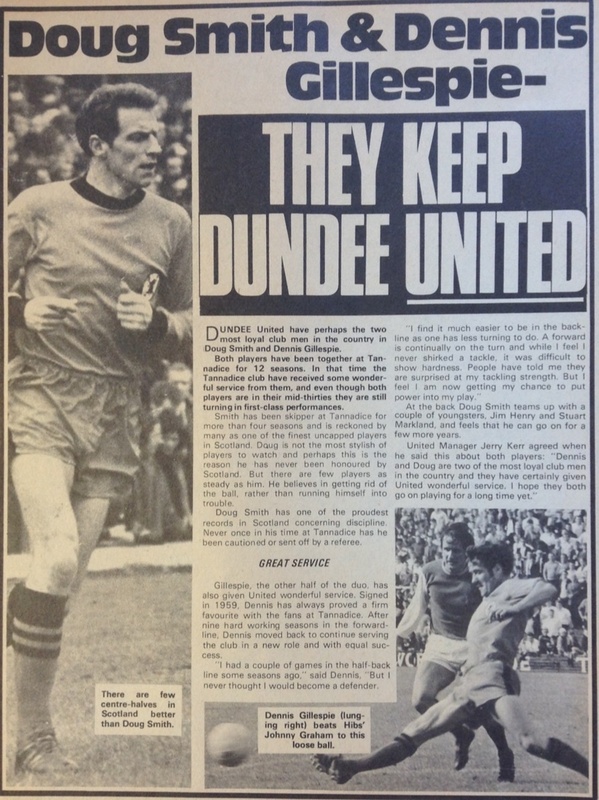 In May 1973, Dennis was awarded a testimonial in which several well known guest players joined his United colleagues and a Dundee XI in front of a crowd of more than 10,000 to pay tribute to a Club legend. Dennis passed away aged 65 in June 2001 after a long illness. 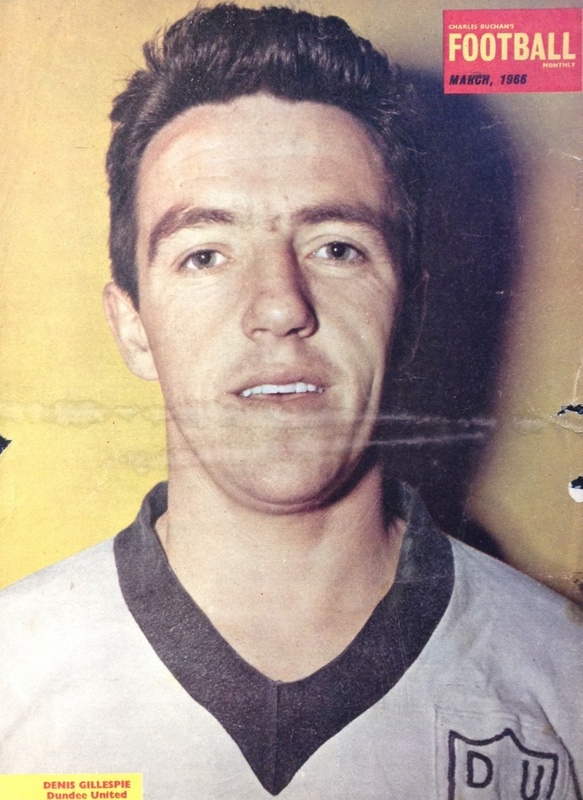 In January 2008, Dennis was one of the first players inducted into the Dundee United Hall of Fame. Dennis was born on this date in Duntochter. 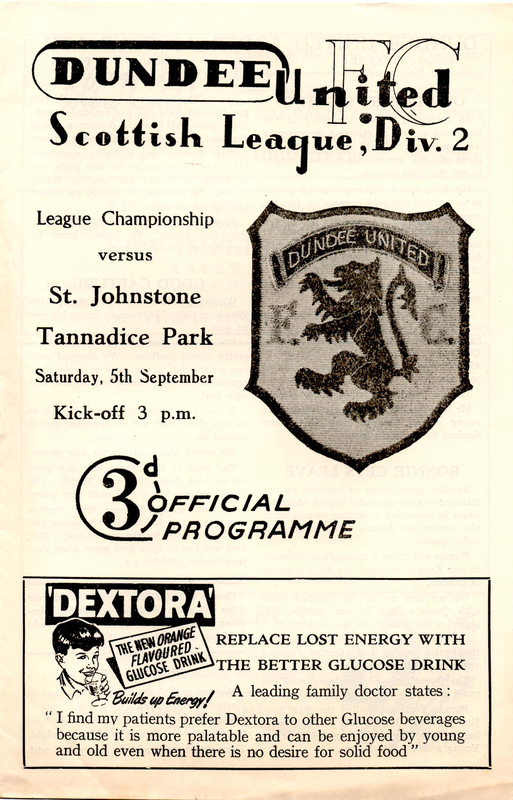 After opening the league campaign with two 1-1 draws, United were keen to table their first win, particularly with the opposition being local rivals Dundee.